Georgia, no peace I find. Just an old sweet song keeps Georgia on my mind. ~ "Georgia On My Mind"
Georgia is a state located in the southern United States. 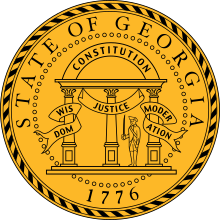 Georgia was one of the Thirteen Colonies that revolted against British rule in the American Revolutionary War. It was the last of the Thirteen Colonies to be established as a colony. It was the fourth state to ratify the United States Constitution, on January 2, 1788. Georgia has prospered because we have refused to be divided. We have worked together, and the nation and the world have taken notice. We are where we are today, the envy of other states, because decades ago our leaders accepted change while others defied it. In the long run, it has paid us handsome dividends. Our people do not need to bleed the color of red Georgia clay. We have a great deal to be proud of as Georgians. Our history, our heritage, our state's great natural beauty. But, nothing should make us prouder than the way Georgia has led the South by focusing on the things that unite us instead of dwelling on those that divide us. What will be the result to the institution of slavery, which will follow submission to the inauguration and administration of Mister Lincoln as the President of one section of the Union? My candid opinion is, that it will be the total abolition of slavery... I do not doubt, therefore, that submission to the administration of Mister Lincoln will result in the final abolition of slavery. If we fail to resist now, we will never again have the strength to resist. Where Gladys Knight took the Midnight Train; the birthplace of Martin Luther King. Darion Crawford, "Georgia" (9 October 2005), Light Poles and Pine Trees (20 June 2006), New York City: Geffen Records. Georgia, where the peaches grow. They drink lemonade and speak real slow. I do not think we have to discriminate against anyone to protect the faith based community in Georgia of which my family and I are a part of for all of our lives. The people of Georgia having dissolved their political connection with the Government of the United States of America, present to their confederates, and the world, the causes which have led to the separation. For the last ten years we have had numerous and serious causes of complaint against our non-slaveholding confederate States, with reference to the subject of African slavery... The party of Lincoln, called the Republican party, under its present name and organization is of recent origin. It is admitted to be an anti-slavery party, while it attracts to itself by its creed, the scattered advocates of exploded political heresies, of condemned theories in political economy, the advocates of commercial restrictions, of protection, of special privileges, of waste and corruption in the administration of Government; anti-slavery is its mission and its purpose. Social equality is impossible. The schools are not going to be mixed, come hell or high water. Started in Atlanta, then I spread out with it. South Carolina, Alabama, Mississippi. On to North Carolina, Philadelphia, and Virginia. From down in Miami where it's warm in the winter. On up to Minnesota where it storms in the winter. Clifford Harris, "We Takin' Over"
Let freedom ring from Stone Mountain of Georgia! Martin Luther King, Jr., "I Have A Dream" (1963), Washington, D.C.
We're on the grind in Georgia, all the time. It ain't nothing no my mind, but Georgia. By the original compact of government, the United States had certain rights in Georgia, which have never been relinquished and never will be... Allow the Union and peace once more to settle over your old homes at Atlanta. I was watching the news reports from Baltimore and hearing all the condemnations from some about being kept down and the lack of jobs, opportunity, good schools; then why do these blacks keep voting for the same people? And this isn't a phenomenon isolated to Baltimore. Every single major urban center in America is run by Democrats; more specifically, liberal progressives, black or white. The morass that became Detroit. The killing fields of Chicago. The depravity of Washington, D.C. The shame of South Dallas. And yes, even the place that was once my home, Atlanta, even with all the successful black entertainers. Now, I remember the first black mayor of Atlanta, Maynard Jackson. That guy was a leader and even spoke at my high school Baccalaureate. But today, Atlanta Mayor Kasim Reed has done such a bang-up job that the Atlanta Braves are moving to Cobb County! Just do the assessment yourselves, who are the elected officials heading up the urban centers? And where does one find the most dire socio-economic statistics? Allen B. West, "The dirty little secret no one wants to admit about Baltimore" (18 May 2015), National Black Republican Association. Hurrah! Hurrah! We bring the jubilee! Hurrah! Hurrah! The flag that makes you free... So we made a thoroughfare for freedom and her train, sixty miles in latitude, three hundred to the main. Treason fled before us, for resistance was in vain, while we were marching through Georgia... Yes and there were Union men who wept with joyful tears, when they saw the honored flag they had not seen for years. Hardly could they be restrained from breaking forth in cheers, while we were marching through Georgia. This page was last edited on 22 October 2018, at 23:35.